These little guys look very rustic but geez they taste good. A friend dropped in the other day. Luckily, I had some muffins in the freezer so it was just a matter of zapping them for a few seconds to create an impromptu morning tea. The situation reinforced to me how useful a few muffins the freezer can be. When my friend left, I thought I would grab the opportunity to replenish our supply. The trick with muffins is to combine the dry ingredients and the wet ingredients with a minimum of mixing. The mixture may look lumpy, but as long as the dry ingredients are incorporated, the mixing is complete. 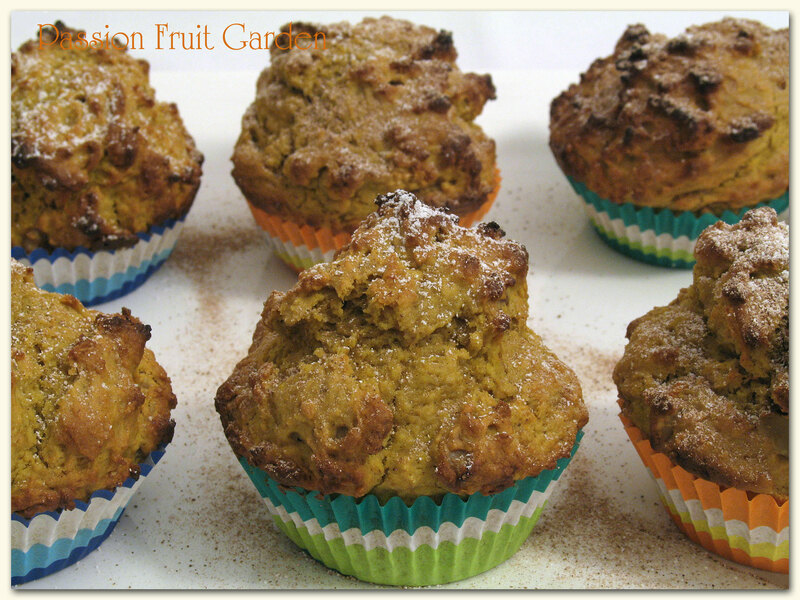 This recipe comes from a wonderful little booklet entitled Muffin Magic by Diana Linfoot. Diana is from Western Australia. The book was published in 1989 when muffins were all the rage. Everyone seemed to have this booklet at the time – maybe it was just a Perth thing, I am not sure. There are piles of muffin recipes in the booklet and then there are variations on the theme. This recipe is one of the variations on the basic pumpkin muffin recipe. Equal parts cinnamon and sugar (about ½ tsp of each) mixed together. Preheat your oven to 200°C and prepare your muffin pans. Mix together, the butter, sugar and golden syrup. Beat in the eggs and then the pumpkin puree. In a separate bowl, sift all the dry ingredients (except the walnuts) together. Fold the dry ingredients into the wet mixture. Spoon the mixture into the prepared pans. Bake in your preheated oven for about 15 minutes. This entry was posted in Eating your bounty, Muffins and friands, Pumpkins, Sweet Things and tagged pumpkin muffins by Glenda. Bookmark the permalink. I’m just now sitting down to catch up with all of my favorite blogs and as always, you have something that gets my tastebuds going. Aren’t you the clever one though – having little stashes of these in the freezer. I guess I just never think to do things like that but now that it’s a new year, maybe that will be my resolution (I don’t really make resolutions so maybe I should just call it a potential goal). Thanks so much Diane. Happy new year to you too. Hi Moya, Best wishes to you too. Thanks so much. I do like that combo. I always have muffins in the freezer, Glenda. You cannot bake just one or to, so, when I bake a dozen, 10 go into the deep freeze as soon as possible. Out of sight, out of mind. Never tried a pumpkin muffin, though, but it looks like it might be time. These sound very good! Yum 🙂 Lovely flavour combination… I do pumpkin and walnut salad or pasta. Hi Ella, it is a great combo. It is Sandra but I am afraid, it isn’t gluten free.